Lengthen tyre life. Reduce fuel consumption. Lower environmental impact. Safer car Handling. This is an increasingly important service on modern cars as the majority now have many adjustable components within the steering and suspension systems which, if not set correctly, can cause misalignment. Note that this is an entirely superior level of service to standard wheel tracking alignment that you get with tyre fitters. Contact us to fix the tracking and alignment on your car. ​Don't forget to download our limited time special offer voucher! What happens during wheel alignment? You will receive two documents. 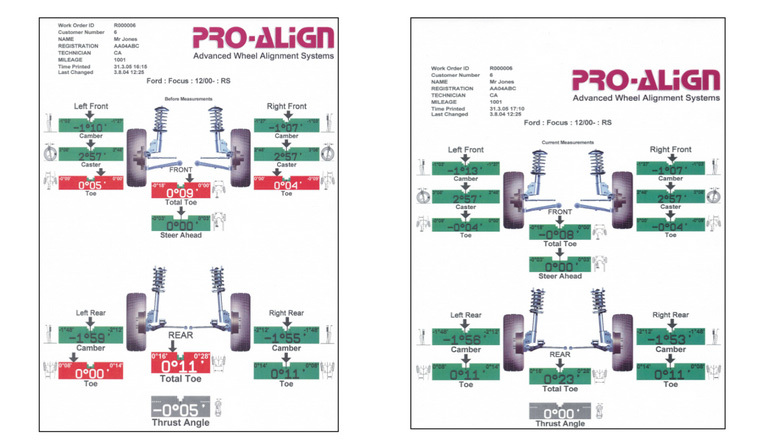 The first document, shows the alignment settings on your car against manufacturers specifications. If adjustment is needed and agreed, the second document is your proof of the actual setting after adjustment work by our IMI accredited technicians. ​Does my car need a Hunter wheel alignment? Have you ever noticed your tyres wearing more on one side than the other? Perhaps your car feels as if it pulls to one side? Or maybe your steering wheel isn’t straight? These are all possible symptoms of misalignment and often lead to higher running costs as your tyres need replacing sooner or your fuel bills will be increased. Misalignment can occur easily. Hitting a kerb, driving over a pothole, replacing a tyre or simple day to day wear and tear can all lead to your car suffering from misalignment. By letting us check your alignment regularly you can be confident that these negative effects are minimised and your car remains in the best possible condition. Looking for more information? Contact us or visit the align my car web site.